Cu/Al Radiator Ends consist of mixed copper and aluminum cutoffs from copper and aluminum radiators. Radiators cutoffs usually contain steel, aluminum, and copper pipes. The scrap metal value comes from the copper. 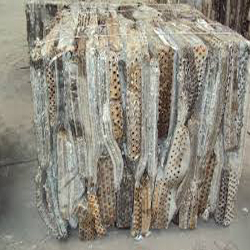 The radiator ends are generated from cleaning copper and aluminum radiators, when they are cut off the main radiators.